On the advice of the State Librarian one fine day in the 1970s, a truck transported thousands of books and magazines from Pretoria’s Central Police Station to a dark hall at the Iscor state steel company, just outside the South African capital. A large mechanical shovel scooped up and dropped them into a 20 metre high oven, causing it to spew flames and smoke. This was another truckload of material that had been banned for political reasons and was routinely burned in furnaces across South Africa from the 1950s to the 1970s. Historical examples show that books are banned and destroyed because they offend the politics, morals, or religion of the day. Information science academic Rebecca Knuth, wrote in Burning Books and Leveling Libraries that if a regime is racist, it destroys the books of groups deemed inferior; if nationalistic, the books of competing nations and cultures; and if religiously extremist, all texts contradicting sacred doctrines. Sometimes these forces combine. Recent examples include the destruction of Muslim books and libraries in Bosnia in the 1990s by Serbian nationalist forces. In 2013 there was the burning by Islamist insurgents of the Timbuktu library and the next year the same happened in Lebanon to Tripoli’s historic Al Sa'eh Library. The apartheid era – from the middle of the 20th century – had its own variation on the theme. Thousands of books were banned, ranging from Russian novelist Fyodor Dostoyevsky’s The Insulted and Humiliated to popular Westerns writer Louis L'Amour’s Hopalong Cassidy series. The fact that books were burnt underscored the state’s desire to make sure the printed word was utterly destroyed. The practice also revealed a darker side of the library profession which connived in the book burning. Between 1955 and 1971 most librarians didn’t protest when thousands of books and other reading material were taken from libraries, and burned at municipal incinerators and furnaces. Some even joined in. The rise of authoritarianism State sanctioned book burnings were common as authoritarianism accompanied a growing Afrikanerisation of South African society as the dominant, ruling Afrikaner elite started to impose its culture on all spheres of society. Members of the elite did this first by unifying Afrikaner cultural and church organisations. This took the form of a declaration on behalf of “Volksorganisasies” (Afrikaner people’s organisations) that was signed in 1941 and pledged support for conservative Christian national ideology. This sometimes involved the burning of books as a symbol of purification. One of the more worrying aspects was the solid support from ordinary South African librarians for these treacherous acts. Even when books were burned by public libraries, the profession meekly accepted the situation. This signified support and agreement with what was happening, and reflected the dominant authoritarian mood and spirit in South Africa and the library community at that time. All copies are brought in to me and I destroy them personally. We will have a big bonfire and burn them. What started as the burning largely of imported pornographic books, became an all-out attack on free speech after the findings of a commission of inquiry into “undesirable publications” were made public in October 1957. The inquiry gave the Nationalist government the excuse to destroy books and pamphlets critical of its policies, and of dramatic developments in the country. Each new issue of the Government Gazette included the latest additions to the list of banned books. Books on communism and those that criticised apartheid dogma were targeted. In 1954 banned titles included the Pravda and Daily Worker newspapers, and Vladimir Lenin’s Two Tactics of Social-Democracy in the Democratic Revolution. Books on innocuous topics about communist countries, like China’s “Railways and Labour Insurance Regulations of the People’s Republic of China”, were also deemed subversive and added to the list. Even Ray Bradbury’s dystopian novel Fahrenheit 451 (which, ironically, is the temperature at which book paper starts burning) was burned. From the town of Brakpan in the North to Durban in the East and Cape Town in the South, several thousands of books were removed from library shelves and burned. 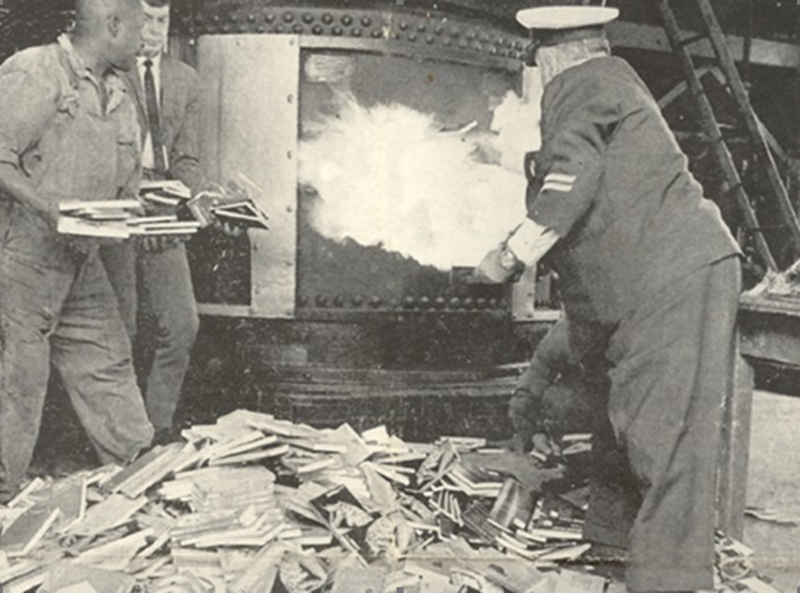 In July 1964 Cape Town City library services announced that more than 800 books had been burned. By this time the list of banned publications had swelled to a total of 12 000 titles. In June 1968, a newspaper reported that 5 375 books of the Natal Provincial libraries had been withdrawn from circulation and burned. By April 1971 books were still steadily being burned in Cape Town – at the rate of two per day. It was only in the late 1980s that successful appeals from a few brave librarians to the state censors saw restricted books unbanned, and saved from apartheid’s furnaces. In the early-1990s as South Africa moved towards becoming a democracy hundreds of archival documents and public records were shredded and burned by the apartheid state’s security establishment – once again in the furnaces of Iscor. Could book burning happen again in contemporary South Africa? Given a similar set of circumstances, there is every reason to believe that it can. South Africans should remain diligent and alert to threats to freedom of expression. The ashes of burnt books tell of the barbarism to which a society can descend.